Thanks to the huge generosity of our supporters we raised a whopping £2,500 for studio equipment. Since the campaign our artists have been working hard in Studio 53, creating lots of fabulous new work including digital drawings, video and sound-based work using the new iMac you helped pay for. And we’re looking forward to our upcoming exhibitions in November as part of our PERSPECTIVES series, where we’ll be putting our new projector (which you also helped pay for) to good use by showcasing our artists’ moving image projects. We hope you’ll be able to join us there! 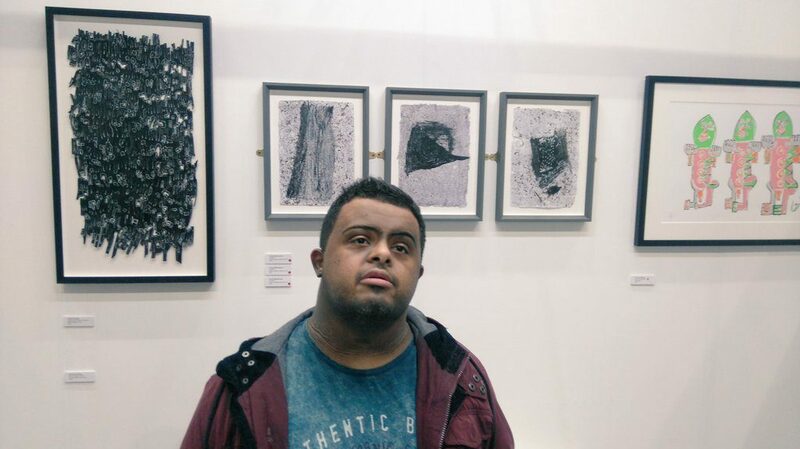 Ahmed Mohammed in front of his ‘Untitled’ triptych, sold to collectors at TMC 2017.